We are excited to share with you two new tools we’ve developed in the past year to better serve our girls and young women: the Youth Experiences Survey (YES) and the YWRC Resiliency Survey. We are proud to be a leading agency in youth-specific trauma and resiliency research and look forward to sharing these tools with other organizations. Before we dive into our development methods, why this is important and what it all means, we’ll start with a glossary to serve as an introduction or refresher of key terms. 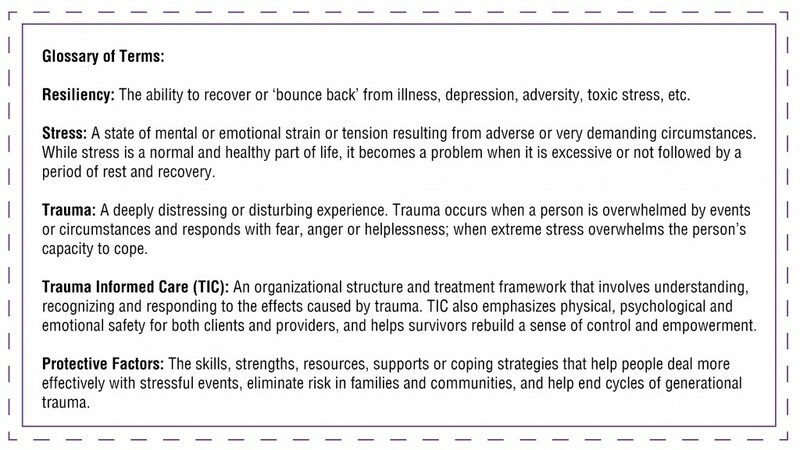 Over the past year, the YWRC has focused on incorporating Trauma Informed Care into our programming and sharing our knowledge with the Greater Des Moines community. One major way we have done so is by researching and developing two inclusive, one-of-a-kind, youth-tailored tools to measure trauma history (Youth Experiences Survey) and changes in resiliency over time (YWRC Resiliency Survey). One of the main goals of these tools is to help reverse negatives effects of childhood/adolescent trauma experienced by our clients. There is a direct correlation between trauma and later-in-life physical health conditions such as diabetes, heart disease, high blood pressure, depression and substance abuse. While this can seem daunting, the good news is that we know there are things our clients can do to lessen or reverse these negative effects so they can have healthier, brighter futures. Why are these surveys important? Through research, it became apparent that the YWRC needed to develop a tool that would establish a baseline for trauma history of the clients we serve. Before we created the Youth Experiences Survey (YES), the only other existing tool we found that focused specifically on youth was the Child and Youth Resilience Measure (CYRM). While the CYRM is targeted to youth, its international focus did not align with our goals. Several other existing surveys, questionnaires and resiliency studies were reviewed, such as Iowa ACEs, but were found to be established for adults or to be used strictly in a clinical setting. We then determined to develop our own tool to better target specific youth-centric information for the population we serve. Utilizing results from YES, we are able to tailor our programming curriculum to provide lessons on targeted, need-based coping and resiliency building skills. YES is comprised of 12 questions that specifically focus on areas of mental and emotional trauma for youth and is written at a fifth grade reading level. This survey also takes into account mental and emotional capacity of youth, ensuring the questions are age appropriate and not re-triggering of trauma. The YWRC also included trauma/stressors that are most often experienced as youth, which have not previously been accounted for in existing surveys such as ACEs. The 12 areas YES focuses on are: physical abuse, emotional abuse, sexual abuse, substance abuse in the home, mental illness in family members, incarcerated family members, separation or divorce of parents, family violence, physical neglect, death or serious illness with someone close, ran away/lived in a shelter/lived with a relative, and moved three times within the last year. Our staff worked on developing the YWRC Resiliency Survey through the fall of 2016. The survey questions tie directly back to the four key categories of youth resiliency. After several rounds of the YWRC Resiliency Survey being administered, the results were analyzed by Simpson College and the surveys were determined to be reliable and valid. With strong baselines established through our YES survey, the YWRC Resiliency Survey will show us program impact and areas of growth. In January 2017, YES was administered to 304 YWRC clients representing all YWRC programs (Empowerment, Young Moms, therapy, etc.). We are now in the process of analyzing the comparison of changes in scores from the surveys given in January 2017 and June 2017. Results will direct programming changes to strengthen resiliency skill building in areas that show lower scores. This continuous quality improvement in group programming will be invaluable. Building protective factors for clients in key settings like schools and homes takes a community effort. The YWRC has begun sharing the results of our research, survey tools and lessons learned with the community in effort to further collaborate and improve tracking for other local organizations. United Way of Central Iowa (UWCI) is one such organization the YWRC works closely with, as they are one of our funders and house the ETO data system we use for program data and client information. After sharing the YWRC Resiliency Survey with them, UWCI agreed the YWRC could shift to using the YWRC Resiliency Survey as our measure of change/progress and incorporated the survey into their database. Social Solutions, the national software company that manages ETO products, also contacted the YWRC as they are considering using the partnership between UWCI and the YWRC Resiliency Survey as an innovative case study to highlight in their company. One goal throughout our research and development process was to ensure these tools could be available to other organizations. While we hold the copyright for these tools, we will be making them available to other organizations soon. Interested in learning more? We will be sharing the January – June 2017 survey results in the near future; keep an eye on our monthly e-news and social media for announcements. In the meantime, you are welcome to contact us with questions or comments at 515.244.4901 or via email.